Youth crime is simultaneously a social problem and an intrinsic part of consumer culture: while images of gangs and gangsters are used to sell global commodities, young people not in work and education are labelled as antisocial and susceptible to crime. This book focuses on the lives of a group of young adults living in a deprived housing estate situated on the edge of a large city in the North of England. It investigates the importance of fashion, music and drugs in young people's lives, providing a richly detailed ethnographic account of the realities of exclusion, and explaining how young people become involved in crime and drug use. Young men and women describe their own personal experiences of exclusion in education, employment and the public sphere. They describe their history of exclusion as 'the life', and the term identifies how young people grew up as objects of suspicion in the eyes of an affluent majority. 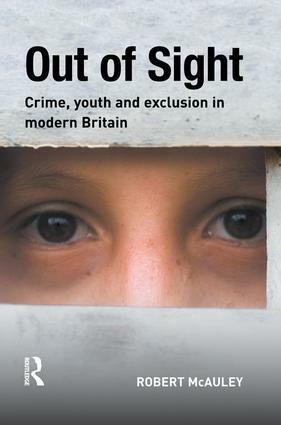 While social exclusion continues to be seen as a consequence of young people's behaviour, Out of Sight: crime, youth and exclusion in modern Britain examines how stigmatising poor communities has come to define Britain's consumer society. The book challenges the view underlying government policy that social exclusion is a product of crime, antisocial behaviour and drug use, and in focusing on one socially deprived neighbourhood it promotes a different way of seeing the problematic relationship between socially excluded young people, society and government.